Kids can help stack the layers! Unroll the crescent rolls and cut them along the perforations. Bake on a large baking sheet for 8-10 minutes, or until golden brown. Let cool. In a medium bowl over medium heat, combine the raspberries and sugar, stirring until the sugar has dissolved and the raspberries disintegrate, approximately 10 minutes. Let cool completely on the countertop. In a medium bowl, combine the pudding mix and milk, whisking for 2 minutes; refrigerate 10 minutes. Combine the cooled raspberry sauce and pudding; fold in whipped topping. Chill for 1 hour. 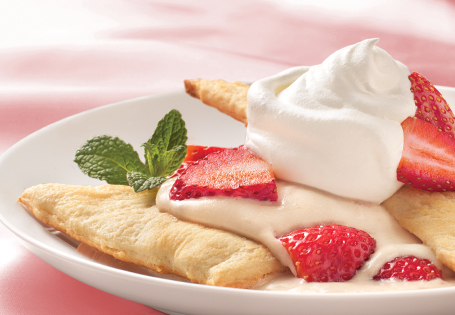 Layer the pudding mixture, strawberries and crescent roll triangle, repeat the layers. Garnish with remaining whipped topping, if desired.